Have you ever purchased something and later wondered why on earth you brought it home with you? You’re not alone. Such is how George Washington University ended up with its beloved second mascot. In 1996, then University President Stephen Trachtenberg (for whom the Trachtenberg School of Public Policy and Public Administration is named) purchased a bronze hippo while on vacation in Rhode Island. The general conception is that he went antiquing in an inebriated state and became charmed with the “river horse”. When the hippo was delivered to the Trachtenberg home in Washington, D.C. it received a less than warm welcome from Dr. Trachtenberg’s wife. The then wayward hippo was promptly forwarded to GWU, made a gift to the class of 2000 and established in front of Lisner Auditorium. 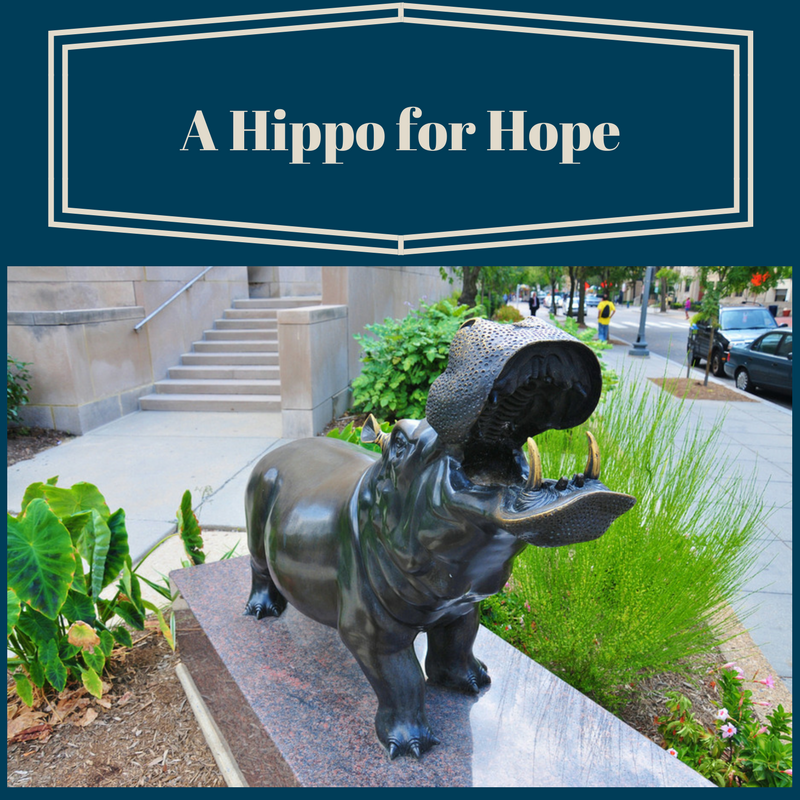 The relevance of a hippopotamus to GWU seems very tangential. George Washington had dentures made of various materials, one of which was hippo ivory. George also at one time expressed interest in using a dredging tool called a hippopotamus, invented by Arthur Davidson, to dredge the Potomac for fertilizer for the farm at Mount Vernon. Further connection escapes us. Despite these tenuous Washingtonian ties, this particular pachyderm has found a place of pride at the school, and has proven itself to have been a worthwhile purchase. The explanation on the plaque below it fancifully roots it in the history of the Washington family and GWU. Legend has it that the Potomac was once home to these wondrous beasts. George & Martha Washington are even said to have watched them cavort in the river shallows from the porch of their beloved Mount Vernon on summer evenings. Credited with enhancing the fertility of the plantation, the Washingtons believed the hippopotamus brought them good luck & children on the estate often attempted to lure the creatures close enough to the shore to touch a nose for good luck.